We have discussed triangle congruence and in this series, we are going to use the congruence theorems in order to prove that two triangles are congruent. We can see that there are two overlapping triangles: triangle and triangle . by the Isosceles Triangle Theorem. 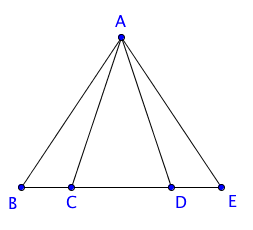 Triangle is an isosceles triangle since (given). Now, the Isosceles Triangle Theorem states that opposite angles of the congruent sides of an isosceles triangle are congruent so, . by the Isosceles Triangle Theorem (the explanation is the same same as above). This is what we want to prove.